Elizabethan and Jacobean London contained a myriad of playhouses, indoors and outdoors. What follows is a very brief outline of some of the most famous of those playhouses, arranged alphabetically. ('Hover' mouse pointer over picture to see caption. Click to go to larger version with more information). The name Blackfriars actually refers to two successive theatres. The 1st theatre was established on the grounds of what was the Blackfriars Dominican monastery in 1576, and until 1584 it housed the children’s company The Children of the Chapel Royal. They worked under the direction of Richard Farrant, Master of Windsor Chapel. After Farrant’s death in 1580, William Hunnis took over direction. In 1583 the theatre was given to John Lyly, who wrote plays for performance in the theatre, and the theatre’s lease expired in 1584. In 1596 James Burbage bought the lease to a different part of the Blackfriars priory with the intention of building an indoor playhouse. Wealthy area residents kicked up a fuss, and the endeavour was forbidden by the Privy Council. In 1599 Burbage leased the playhouse to Nathaniel Giles and his Children of the Chapel, a boys company that performed plays by Middleton, Chapman, Jonson, Marston, Beaumont, and Fletcher. From 1609 the King’s Men, the company of William Shakespeare and the famous actor (and son of James) Richard Burbage, took up residence at Blackfriars, playing to a wealthier and better-behaved audience than at the raucous outdoor Globe. Even King Charles I’s Queen Henrietta Maria attended performances at this new, classy establishment. The Curtain Theatre was built in Shoreditch in 1576, under proprietor Henry Lanman. Not much information survives about who performed at The Curtain until 1597, when for two years after the closing of The Theatre, the Lord Chamberlain’s Men, the original name for the company of the Burbages, Shakespeare, and Will Kempe, played at The Curtain. Documented productions at The Curtain included Shakespeare’s Romeo and Juliet and Jonson’s Every Man in his Humour. In 1603 Queen Anne’s Men, formerly Worcester’s Men at The Rose, resided at The Curtain. The Fortune Theatre was built in 1600 in the parish of St. Giles-without-Cripplegate, and was for some time home to the Admiral’s Men, the main rivals of the Lord Chamberlain’s Men/King’s Men. The Admiral’s Men was run first by Edward Alleyn, then Alleyn and Philip Henslowe, whose diary offers us so much information about the staging of Renaissance plays. In 1605 Middleton and Dekker’s The Roaring Girl was performed at The Fortune, and the cross-dressing Mary Firth who inspired the play came on to the stage (listen to Emma Smith’s podcast for more information about Mary Firth, The Roaring Girl, and early modern gender politics). In 1621 The Fortune burned down, to re-open in 1623. After Alleyn’s death the theatre passed to Dulwich College. However, during its time belonging to Dulwich, riots, mob attacks, and lude occurrences meant that the theatre’s reputation was soon irretrievable. The Globe Theatre is by far the most famous of the Renaissance playhouses, in no small part due to the reconstruction of Shakespeare’s Globe on London’s South Bank. 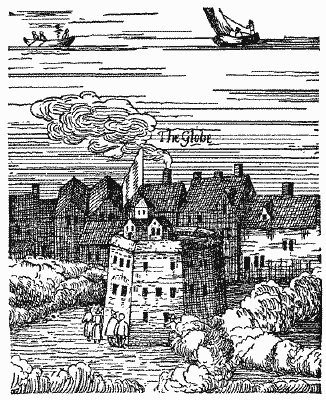 The Globe was built in 1599 by the Lord Chamberlain’s Men (later the King’s Men). The largest share in the theatre belonged to Richard Burbage, son of James Burbage and the star actor of Shakespeare’s company. Shakespeare himself was also a shareholder. The theatre was constructed from the materials originally used to build The Theatre. When The Theatre’s lease expired, the Burbages dismantled The Theatre in order to build The Globe. The Globe was the site of the performance of some of Shakespeare’s greatest works, likely including Henry V, Julius Caesar, and As You Like It. On 29 June 1613 The Globe caught fire and burnt to the ground during a production of Henry VIII. It was rebuilt in 1614. The Red Bull Theatre was built in 1604 on St. John’s Street in Clerkenwell. It was likely built for Queen Anne’s Men, since they were performing there by 1607 and remained there until 1617. Their repertoire included first performances of plays by Thomas Dekker, Thomas Heywood, and Thomas Dekker. After 1617 Prince Charles’ Men took over the Red Bull, and was succeeded by a series of steadily less reputable companies. The Rose was built in 1587 by Phillip Henslowe and John Chomley in the parish of St. Mildred. Prior to building the theatre on the land they leased, Henslowe allowed a brothel to operate in his portion of the land. In 1592 after a series of plague closures, the legendary actor Edward Alleyn led a company made up of Lord Strange’s Men and the Admiral’s Men to perform at The Rose, and Henslowe enlarged the theatre for this new troupe. In 1594 when the plague lessened and the companies split into the Lord Chamberlain’s Men and the Admiral’s Men, the Admiral’s Men, under Alleyn, remained at The Rose. They remained there until The Globe was built nearby, driving the Admiral’s men to The Fortune. The Swan theatre was built in 1595 in the Bankside district, on the grounds of the Manor of Paris Gardens. Francis Langley owned the theatre. From 1597 the theatre housed Pembroke’s Men. However, that summer they performed Jonson and Nashe’s The Isle of Dogs, which caused such controversy that Jonson and actors Gabriel Spenser and Robert Shaa were imprisoned. Though released shortly after, Francis Langley could no longer obtain a license to perform plays, and since he owned the theatre, Pembroke’s Men disintegrated, many actors joining the Admiral’s Men. After that The Swan only performed plays sporadically. We know that Lady Elizabeth’s Men performed Middleton’s A Chaste Maid in Cheapside there in 1613. But The Swan’s half a year as a powerhouse of London drama was over. The Theatre housed the Lord Chamberlain’s Men, the company of Shakespeare and the Burbages, from 1594-1597. We are not sure when it was built, but it may have held Leicester’s Men and the Admiral’s Men before the Lord Chamberlain’s Men. At that time the Lord Chamberlain’s Men was run by actor-manager James Burbage. The Theatre was in Shoreditch, on Holywell Street. When Burbage’s lease expired, the company dismantled The Theatre and carried the pieces to Southwark and built The Globe. 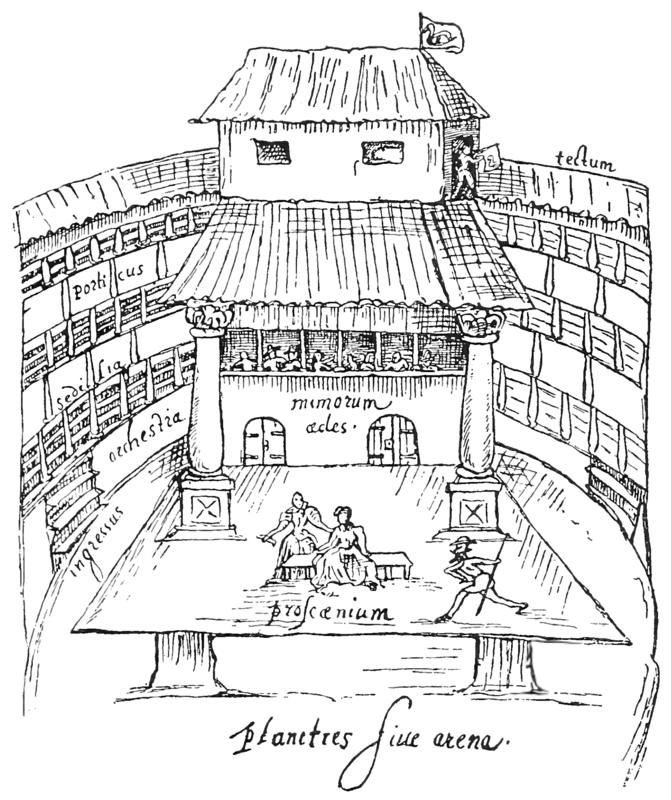 Cite:Elizabethan and Jacobean Theatres by Kate O'Connor at http://writersinspire.org/content/elizabethan-jacobean-theatres. Accessed on Wednesday, April 24, 2019. If reusing this resource please attribute as follows: Elizabethan and Jacobean Theatres at http://writersinspire.org/content/elizabethan-jacobean-theatres by Kate O'Connor, licensed as Creative Commons BY-NC-SA (2.0 UK).